The secret box gutter runs horizontally across the roof, usually about 300mm above the eaves. The gutter may be constructed in timber and usually lined with lead or other suitable material. The ridge side of the gutter can be treated as an eaves and is finished with an eaves tile course, projecting 50mm over the gutter. The tails of the eaves course tiles should be in line with the tails of the first course of full tiles above the gutter. The lower side of the gutter is treated as a top course and will have a short tile course over the last full tile course. The lead lining of the gutter should overlap the top course tiles by at least 100mm. 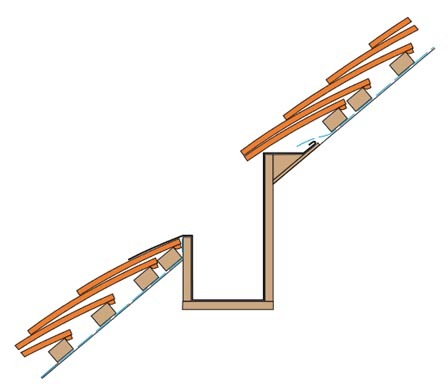 This detail can be used to break up long rafter lengths.